Setup In Just 5 Minutes Or Less! For Just $27 A Month! Professionally Designed, Ready-For-Business Website Setup For You When You Start Your Trial! We created a complete website for you that has all the design components, content pages and feedback forms you need to start sending visitors to your site immediately after you create your user account. Just follow the simple setup wizard to quickly customize it to your business. Get More Leads From Sellers & Buyers With High Converting Landing Pages! Your website comes with two landing pages setup for capturing leads from buyers and sellers. These pages are designed and tested for HIGH conversions so you get the best ROI from your marketing efforts. NOTE: You can EASILY make copies of these landing pages and quickly adjust the headline to use for ANY investment strategy or lead type. Sell Or Rent Properties Faster Why High Quality Images & Property Details Right On Your Website! With the properties feature you can quickly upload images and enter details about all your properties that you have for sale. The details will automatically create a printable flyer that interested buyers can print right from your website, or you can use as a flyer in the take-one tubes in front of your properties. Save Time & Respond To Prospects Faster With All Your Leads In One List! We provide you a centralized leads management list so you can easily see all the submissions from the forms on all your various landing pages and properties. This makes it super easy to scan and keep track of all your new leads. Boost Credibility & Get More Search Engine Visitors By Adding Blog Content! Add content to your site on a weekly or monthly basis to boost credibility, authority, and search engine listings. You don't have to be a professional writer, you can simply post updates of new properties or improvements you've made to an available property. Or, post links to articles you've found on other major sites that you think could be valuable to your visitors. Control Over The Design Of Your OWN Websites Without Knowing A Thing About Web Programming! Making changes to your website is super simple with our drag-and-drop page builder. You can make changes to the existing pages, or create completely new pages. NOTE: This page you're reading right now was build using the site builder we give to you with your website! Create up to 3 fully automated, hands free websites for buying, selling, renting or whatever! NOTE: If you need more than 3 sites, let us know and we can upgrade your membership. Use your own custom branded domain on your websites and landing pages. We provide you with all the tools and support you need to find and register your own company branded domain to use on your website. However, if you already have a domain that you've registered somewhere else, we can help you get it moved over and applied to your RealWebsite site. Simple step by step videos to show you how to Customize & Get The Most From Your Webistes. We've created a complete library of training videos for you to watch and learn how to use every single feature available to get the absolute most value out of RealWebsite™, and to ensure your websites are optimized to drive in leads by the thousands. There are also videos to show you how to integrate with email autoresponders, Google Analytics, setup a PPC campaign, and how to promote your site on the internet to drive in more traffic. FREE Live Chat technical support! Our extensive library of videos will give you all the information you need to be able to completely manage your own websites. However, we completely understand that you may have an additional question or problem, so we offer FREE technical support via Live Chat. You just click the live chat link inside on the dashboard and one of our support specialists will be happy to help you with whatever you need. 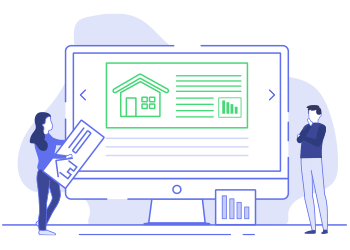 We want to give you full access to the entire system for a full 30 days so you can be sure that this is the real estate investor websites solution for your investing business! If you are not completely satisfied with this service, simply email us within the 30-day trial period and we'll cancel the subscription on the spot. NO questions asked, and NO further obligations or commitments on your part! Simply click the Add To Cart button below to setup your user account and billing information to start your 30 day trial of RealWebsite for just $1. After the 30 day trial period ends you will be automatically billed on a recurring monthly basis (every 30 days) for only $27. You can cancel at anytime by clicking the live chat link inside your account and asking to cancel. Remember: There is literally NO risk here. Start your 30 day trial by creating your user account and get instant access to the RealWebsite system and have your new real estate investor website up in the next 5 minutes! 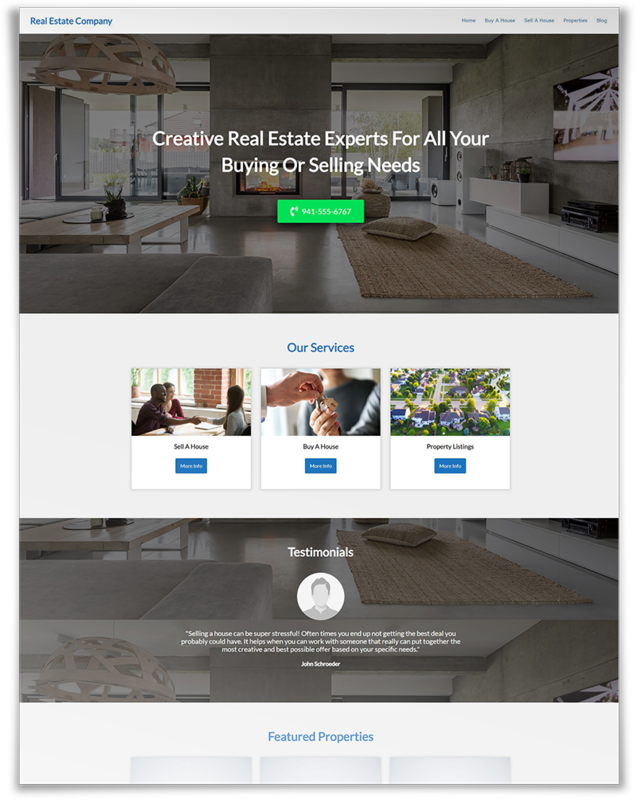 And if you are not 100% convinced that there is no better real estate investor websites solution for your business, then contact us within the 30 day trial and we will cancel your subscription. Response times are within 24 hours and cancellations are immediate with NO questions asked. If you have any questions, take a look at our FAQ page, or contact us by clicking the live chat link on this page. How much does it cost to setup a website? You can start your subscription and make your website live today for just $1 for the first month (then $27/mo) and we give you a FREE domain. Can I try it out and see the website first? Absolutely! Start your trial by clicking the button at the top of this page, connect via Facebook or enter your email address, and then complete the simple website setup wizard to get your fully functional website ready to go. Then when you are ready, activate your account for just $1 and your site is live and ready for business! Yes! There are no long term contracts or complicated cancellation policies. You simply login to your account, and then click the cancel button on your account settings page. Do I need website design experience? Not at all! We've created your website using the tools we provide you for customizing your site. That means that every aspect of your site can easily be customized using the simple drag-and-drop WYSIWYG page builder that we also used to create the website. Can you help me setup my website? Your site is fully setup and ready for business, however if you want to make some changes and aren't completely sure how to do so, were right there to help via live chat support. Ask away and we will do everything we can to help. If you need custom site design done or more complex changes, ask our support team and we can contact you and discuss your needs. Yes, you can create an unlimited number of pages or blog posts on your website. Adding a page is really simple, and then you can select from one of our many page templates to get you started in the right direction quickly. Can I connect my forms to my email autoresponder? Absolutely! All form submissions are stored in a central lead management tab in your RealWebsite dashboard. But you can also have those submissions posted to any email autoresponder, CRM or any other SaaS software either by form post or using a service like Zapier. Every business needs a website that attracts visitors and converts those visitors to leads. That's what RealWebsite is all about!!! Start your trial right now and you'll get a professional looking website setup and ready to convert visitors to leads in 5 minutes or less! You should be focused on running your business, not fumbling around or spending thousands of dollars to get your website setup. We've done all the hard work for you. Now you just have to put your name on it, upload a logo, and make it live and you're ready to go! Most potential clients, customers, or buyers will look at your website to learn more about you before contacting you. Your high quality, professional looking website we provide you will boost credibility and reward you with more leads, deals and profits. Your website is built on the WordPress CMS platform with blogging enabled, and your entire site is SEO optimized. You simply add new property listings, and make simple blog posts announcing your new listings or updates to properties you're working on, and you'll be rewarded with more traffic from the search engines. We have over 20 years experience creating websites. We know what it takes to convert a visitor into a lead. Your site will include core design concepts and landing pages that catch the visitors attention and encourage them to submit a contact form or pick up the phone and call you. Get Setup In Just 5 Minutes Or Less! Our goal is to provide you with a professional level, high quality website that will get you real results from your online marketing efforts. With over 15 years in online marketing and website development experience, we know what it takes to get the results you're looking for, and it all starts with a RealWebsite. © 2019 Real Estate Investor Websites. All Rights Reserved.